Situated 30 minutes from downtown Johor Bahru, Malaysia’s second largest city, this hotel is steps from the Pulai Spring Country Club and 17 km from the Sultan Abu Bakar State Mosque. Three restaurants serve a range of Asian and Western cuisine; one has a breakfast buffet. The bar features cocktails and live music. This hotel also has 2 pools, a spa, and a tennis court. Guestrooms at the 4-star Pulai Springs Resort feature elegant wood or marble flooring, and balconies that look over the country club. Rooms also have cable television and refrigerators. There’s no shortage of places to eat and drink at Pulai Springs Resort. Guests can start the morning at Cinta Terrace, where a breakfast buffet is served daily (surcharge). Gleneagles Terrace offers a wide range of continental cuisine for lunch and dinner, and Qing Palace serves Szechuan fare in a traditionally decorated dining room. Elephant & Castle, an English-style pub with old-world charm, is open evenings till late. A poolside café and bar and 24-hour room service are also available. Meeting and banquet rooms of various sizes can accommodate most events. Complimentary wireless Internet access is available in public areas. A 24-hour roundtrip airport shuttle service is available for an additional fee. This 4-star property has an indoor lap pool and an outdoor pool featuring a children's wading area, a waterslide, waterfalls, and islands. 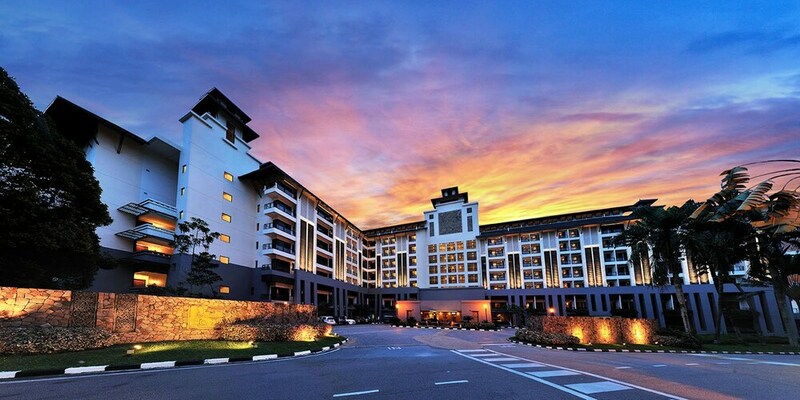 With guestrooms just steps from the Pulai Spring Country Club, guests have direct access to two 18-hole golf courses. The fitness center offers aerobic and yoga classes, and the full-service spa has a sauna and a steam room. Pulai Springs Resort is a smoke-free property. Gleneagles Terrace - Serving a range of Western cuisine for lunch and dinner, this restaurant has a traditional dining room and outdoor patio. Qing Palace - This traditionally decorated restaurant specializes in Szechuan cooking for lunch and dinner. Cinta Terrace - The hotel’s buffet breakfast is served here daily. Cinta Deli - Overlooking the pool, this outdoor deli serves light meals and refreshments. Waterfalls Cafe - poolside cafe serving light dishes. With the Pulai Spring Country Club just steps away, guests have direct access to 2 professional 18-hole golf courses, as well as a driving range. The clubhouse has a café and pro-shop where you can rent clubs and shoes. For lap swimmers, there’s an indoor pool, and the outdoor pool features a wading pool, waterslide, and rock islands and waterfalls. A tennis court, squash court, and paintball course are also located onsite. The fitness center has cardio and weight machines, and hosts aerobic and yoga lessons. Treat yourself to a full menu of massages and body treatments at The Pulai Spa. The spa also features a sauna and steam room. Rollaway/extra beds are available for MYR 84.9 per day.